I thought this picture was a great fit for this week’s photo challenge. 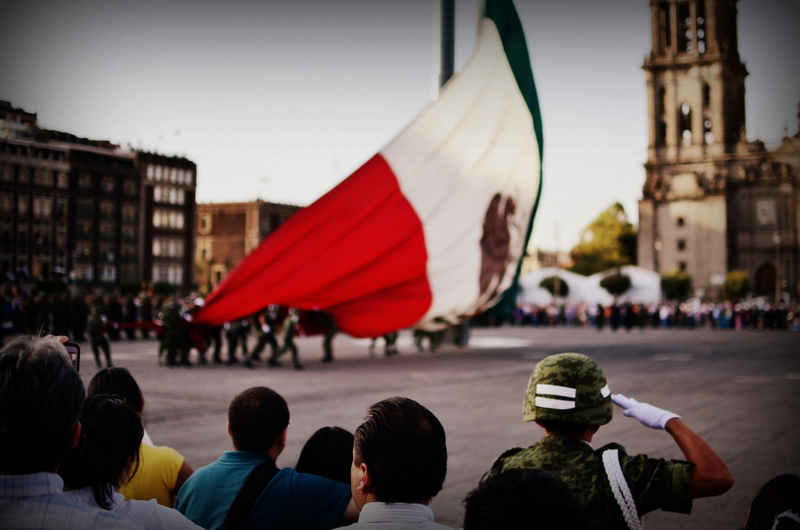 Every day at exactly 6pm the Mexican Army (aka Ejercito Mexicano) has a procession from the Palacio Nacional to the center of the Zocalo to lower the national flag. If you don’t know about this ceremony you will most definitely be surprised when you suddenly encounter hundreds of soldiers marching, complete with fanfare forming an enormous human square around the pole. When the flag is lowered the formalities of “standing in line” completely disappear as men scramble to grab the massive symbol of Mexico before it touches the ground. After securing the flag it is folded up and marched back into the palacio for the night. That’s an excellent photo for the challenge! It´s a beautiful ceremony to see. Great BIG flag! That flag is larger than life, and the ceremony was amazing. Thanks for stopping by!